P.S. You're Lovely: A Gift for a "Little Legacy"
This little beauty was dropped in the mail this weekend to one of my lovely sorority sisters that will be giving birth to a baby girl this summer. Alpha Kappa Alpha Sorority's colors are pink and green so I used Rosaline for the pink, Crystal, and Peridot for the Green. Congrats on your "Little Legacy" and I can't wait to see a picture of her with her pearls! 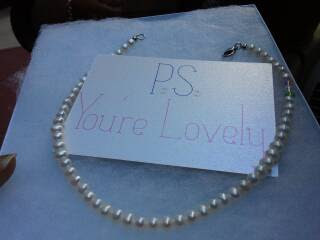 Mission Accomplished....Baby Girls First Pearls arrived safely and our soror LOVED them! "Thank you" for helping me to "surprise" a friend across the miles....love you and continued success! !